“Too soon.” In the days leading up to the count, villagers here in Sakhalvasho conveyed to us that the count would begin in earnest on 20 August. There is something to be said about the collective knowledge of a tightly knit community that has lived on the same land for generations. On 20 August, we were treated not only to several flocks of bee-eaters and a steady stream of swifts, but a first vanguard of Honey Buzzard accompagnied by some Black Kite, Booted Eagle, and other raptor species, lending substance to the villagers’ gut conviction that this date might be significant for raptor migration here in Batumi. The BRC counters are tiptoeing in anticipation of the true ‘wave’ of Honey Buzzards to come as the end of August draws near … Take note of the daily updated count results on www.trektellen.nl! Apart from raptors, other significant observations include the first migration of Bee-eaters, some wagtails, Golden Orioles … As far as resident birds go, a White-backed Woodpecker (a first for the BRC project) was observed from the Shuamta observatory. A significant component of the BRC is outreach. We are fortunate to be joined by 6 Turkish students from the METU Birdwatching Association (Ankara) this month, who arrived on Friday and will be spending 12 days working alongside BRC participants. We are grateful for their interest and enthusiasm, and we hope to send them home with memories for a lifetime and enough impetus to consider a career in ornithology. 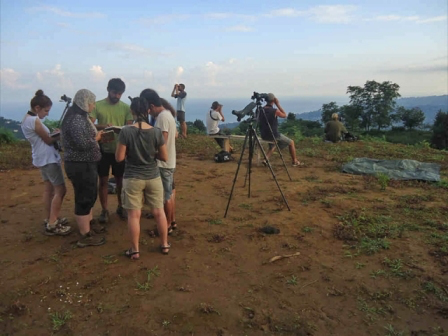 In any case they will leave with lots of new knowledge acquired during one of many (evening) lectures, some 80 hours of count experience and many more talking with amateur and professional ornithologists from across the world. With some literature on the stations and birds in the sky our students are learning to identify guilds of raptors. How could we blame anyone for feeling tired after some 11-hour days of counting and then still doing a great job translating English lectures to Turkish in the evening? Thank you Soner, for being the dream coach of our Turkish student team! 5 minutes of sleep well earned! No less than 10 nationalities are represented in the project at this point from the United States over Sweden or Spain to Iran. After a hard day of counting it is a true pleasure to see how the phenomenon of raptor migration can bring together such different people in such a close group. As if that would not be enough reason for celebration, Marta, one of our Count Coordinators, celebrated her 29th birthday with her new BRC friends some days ago. BRC 2011 … Starting the autumn season!